Olli Jokinen's third period goal gave the Panthers a 3-2 win and helped Florida inch closer to the final playoff spot in the East. Until Friday night, one thing hadn’t happened over the past five weeks: a regulation loss by the New York Rangers. The Blueshirts were on a 10-0-3 run, and it took Tomas Vokoun and a Florida Panthers team desperate for points to stop them. Vokoun made 32 saves and Olli Jokinen snapped a third-period tie with a power-play goal as the surging Panthers won their sixth in a row, beating the Rangers 3-2 before a sellout crowd at BankAtlantic Center. Rostislav Olesz and Jassen Cullimore also scored for Florida, which remained tied with Washington, one point behind ninth-place Buffalo three points in back of Philadelphia for the eighth and final Eastern Conference playoff spot. Jokinen took advantage of Martin Straka’s third-period hooking penalty to break a 2-2 tie. Rangers goaltender Henrik Lundqvist stopped Steve Montador’s blast from the point but couldn’t control it, Jokinen dug the puck out of a crowd in front and scored his team-leading 31st goal of the season at 7:12. The goal stood up as the game-winner because Vokoun stopped all 12 shots the Rangers took in the third period. Vokoun was particularly sharp during a late power play that became a 6-on-4 advantage after Lundqvist was pulled for an extra attacker. His best stop came in the final seconds when he made a save on Chris Drury’s shot from the slot. Gomez and Dan Girardi scored for the Rangers, who would have remained in sixth place in the East even with a win but could have moved within three points of New Jersey, which leads both the Atlantic Division and the conference. The teams traded leads during the first two periods, with Olesz starting the scoring for the Panthers 12:49 into the game and Girardi drawing the Rangers even 2:26 later. Florida then got into penalty trouble near the end of the first, as Montador took penalties for hooking and unsportsmanlike conduct at 17:43 and Greg Campbell was called for hooking with 36 seconds left. 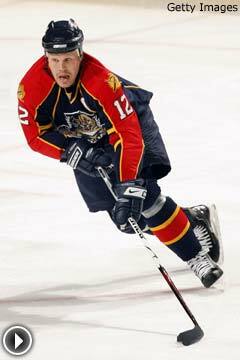 Gomez made the Panthers pay 28 seconds into the middle period when he banged in the rebound of Brendan Shanahan’s one-timer from the point. But Cullimore tied it at 11:42 with a low slap shot from the point that skipped along the ice and past a screened Lundqvist, setting up Jokinen’s heroics in the third. Florida’s win streak is one shy of the team record of seven, set during the 1995-96 season — when the Panthers went to the Stanley Cup Final – and matched two years ago. It began with consecutive shutouts by backup goalie Craig Anderson and has continued thanks to Vokoun’s strong play. South Florida fans have responded; Friday’s game marked the fourth sellout this season at BankAtlantic Center.